The proportional pressure reducing valve PDR08-01 is a direct-acting 3-way spool-type valve, with relief included. Its function is to maintain a constant pressure at the consumer. When it has no more energy, it closes the port 2 and it connects the port 1 (consumer) to the port 3 (tank). When the control current increases, the solenoid coil exerts a force on the control spool. 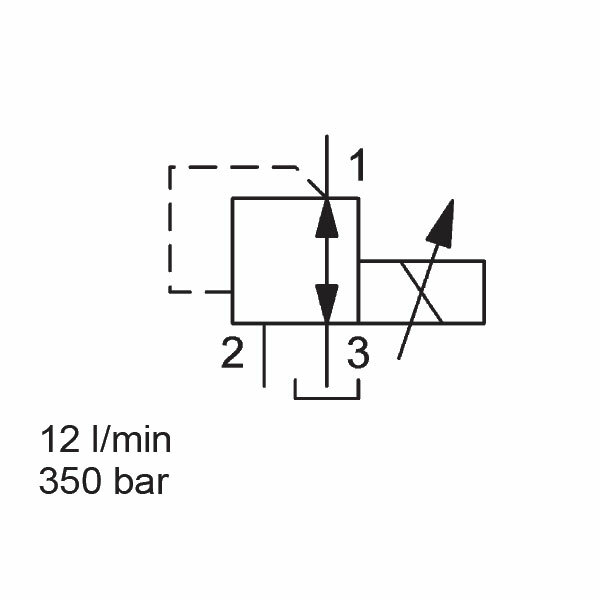 This force is proportional to the control current and thereby, defines the regulated pressure at port 2. This setting is proportional to the control current. In addition, the valve has a pressure relieving function. If the pressure across consumer port 1 rises above the control pressure due to an external force, it pushes the control piston further against the spring. It therefore relieves the consumer to tank port 3. Any pressure at port 3 is additive to the pre-set control pressure.